Valve made the final of three reveals today. In this final announcement, Valve announced the design of a new controller they had been working on. This was one of the many rumors going around about what might come after the SteamOS and Steam Machine reveals from earlier in the week. This controller moves beyond the dual analog sticks of modern console controllers. Instead, it focuses its inputs on dual trackpads. Valve touts these trackpads as having the fidelity of movement of a mouse and the ease of use as an analog stick. The most prominent elements of the Steam controller are its two circular trackpads. Driven by the player’s thumbs, each one has a high-resolution trackpad as its base. It is also clickable, allowing the entire surface to act as a button. The trackpads allow far higher fidelity input than has previously been possible with traditional handheld controllers. Steam gamers, who are used to the input associated with PCs, will appreciate that the Steam Controller’s resolution approaches that of a desktop mouse. This is a very interesting design choice and could shake things up in the controller market, which, aside from Nintendo, has remained rather stale. The introduction of trackpad based input over the traditional analog stick or buttons should result in a change of thinking in how we interact with our games. Aside from the trackpad, the controller features a touch screen in the middle, kind of a cross between the Ouya’s touch pad and the Wii U’s Game Pad. It will have the ability to display various inputs and menus and provide the ability to move and select individual options. The controller also touts 16 buttons with half of them accessible without moving your thumbs from the trackpads. Every button and input zone has been placed based on frequency of use, precision required and ergonomic comfort. There are a total of sixteen buttons on the Steam Controller. Half of them are accessible to the player without requiring thumbs to be lifted from the trackpads, including two on the back. All controls and buttons have been placed symmetrically, making left or right handedness switchable via a software config checkbox. The eight accessible buttons would be the 4 shoulder buttons, two underside buttons and the trackpads themselves which can be depressed as button inputs. The controller has also iterated on the traditional vibration based feedback. This new feedback method is designed not to just shake the controller, but to also provide feedback as you use the trackpads. This update provides valuable feedback to players without the need for them to even look at their hands and controller. This is a huge step forward if it is done correctly. Valve has also worked hard to make sure that this controller can actually be used in cases where the games require a mouse and keyboard. Through its API, it can convince the games you are playing that the inputs they are receiving are from the traditional PC input devices. This will help with legacy support while still moving the hardware forward. 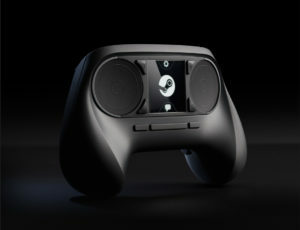 This controller will also come as part of Valve’s hardware beta. Those who are chosen to get the beta Steam Machines will also get one of these controller, minus the touch screen. It would be exciting to get a hold of one of these. All in all, this controller is a breath of fresh air for a stale controller market. For far too long, we have remained content with the old ways of interacting with the games we play. If this controller is as good as it sounds, it could revolutionize the way we play.